It certainly looked as though you liked our 'Take Flight' theme, all your entries were absolutely outstanding, thank you all so much for making it such an enjoyable challenge. Very well done to you Leesa, a superb piece of work, please mail me brenda@ibas.co.uk within seven days of this post with your full name and postal addy so I can arrange for your prize to be sent off to you. I know you are in Aussie so no idea how long delivery takes, but will do our best to speed it your way. And don't forget to grab our winners sidebar button. Congratulations to you all, well deserved winners, please pick up our top three button to display on your own blogs. I will be back on Sunday was another exciting challenge. Good afternoon to all you crafters out there, I hope you're having a good weekend. For those of us in the UK the bank holiday weekend weather is pretty much par for the course with lots of rain, but that gives us the perfect opportunity to indulge in some crafting. And if you're looking for some inspiration or have a 'need' to do some crafty shopping then you'll pleased to know that tomorrow the Christmas launch demo weekend continues at Sir Stampalot's shop in Peterborough. 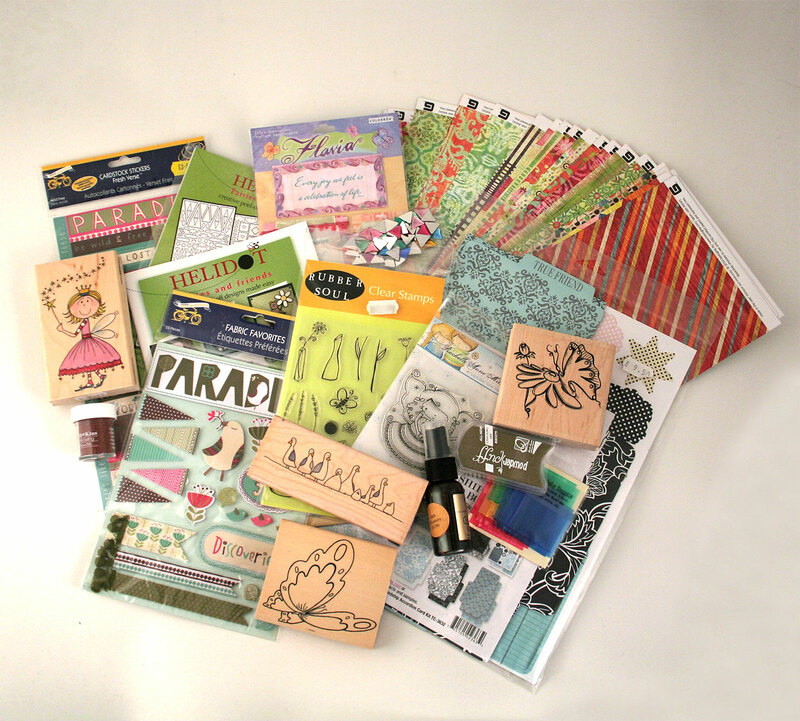 There are loads of new crafty goodies in store and on line including all the new Christmas stamps and products from Penny Black and Hero Arts, new embellishments from Marianne and Adorable Scorerbals from Hunkyadory which are great for really quick and easy cards if you are pushed for time. And that's just a taster of what's available. Everything is listed under the What's New section here. 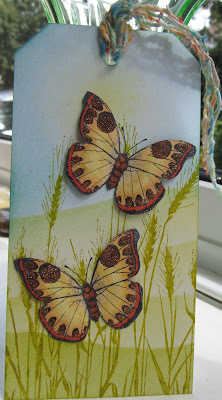 I was in store yesterday when Clare Rowlands was demonstrating her new Molly Blooms summer bonus collection of stamps and there's a huge rack of them to choose from, along with loads and loads of inspiration. So if you feel like a trip there tomorrow don't forget to take your camera. 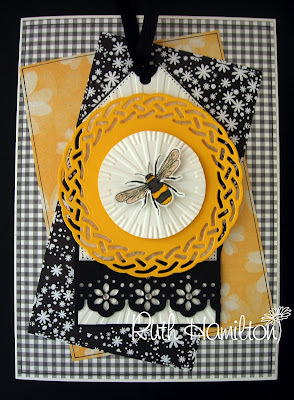 Needless to say there were a few of the new goodies which I 'needed' and Janice asked me if I would share a few of the cards I have made using the new Penny Black Christmas stamps along with the new Madison paper collection and the yummy new Frantage colours. Time seemed to get the better of me though as I've only managed three fairly quick and simple cards but I did enjoy my little play and am impressed with the new Penny Black Christmas sentiment set, it's got loads of sentiments including one or two quite unusual ones offering lots of possibilities. You can check out all the products I've used by clicking on the thumbnails above. So if you are at a loose end tomorrow do pop along to the shop, you won't be disappointed. Meanwhile enjoy your Sunday. Following our 'Meet the Design Team' feature, this month I would like to introduce Lynne and Sally. It has been my pleasure to meet both of these ladies, initially when they attended my classes at Sir Stampalot and like all of the design team, have since become firm friends. 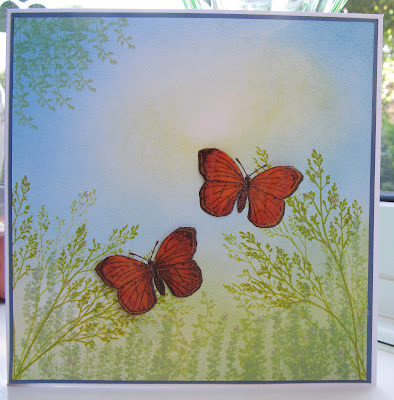 Lynne expresses her love of nature and butterflies through her artwork and Sally has a self confessed obsession with trees and all things inky, but I will let you read their own words about their crafting journeys. 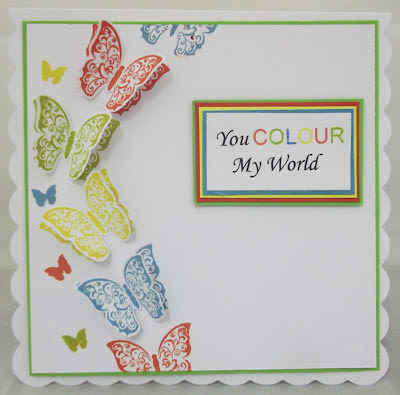 But first a heads up on the latest new goodies in store at Sir Stampalot, there are some amazing new colours in the Frantage range, if you've not tried these new embossing powders yet then I highly recommend them. The new Clear Magic Christmas stamps are now in store and on line, along with a new range of stamps from Inky Antics and Little Darlings stamps will be arriving any time now, so keep an eye on the What's New section. And if you are looking for inspiration, then the Christmas Launch weekend this coming Bank Holiday weekend is a must for your dairies and don't forget your cameras as there will live demonstrations from Saturday through Monday. "Yorkshire born and bred, I've been married for 38 years and have a daughter, a son-in-law and two gorgeous grandsons aged 7 and 3. Recently my husband and I exchanged urban Nottingham, where we lived for 30 years, for the beautiful countryside of Bonnie Scotland to be near our daughter and family, who live in Dumfriesshire. When I am not at work as a primary school singing tutor, or ensconced in my craft room, I am often to be found tramping over the local fields or along the nearby riverbank in anorak and green wellies (not the posh sort!) with camera in hand"
"I have been crafting for longer than I can remember, and cardmaking and stamping for at least 20 years. There were artists and craftspeople among my ancestors, so it's probably in my genes. 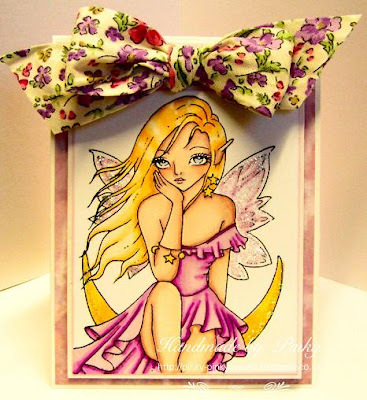 I have dabbled in all sorts of crafts over the years – cross stitch, embroidery, silk & glass painting, encaustic art, quilling, parchment craft, teabag folding, cake decorating, jewellery making, to name a few, but my main love is rubber stamping. I started stamping when I saw someone at a craft fair demonstrating heat embossing. It seemed like magic, and I was hooked from that moment. I still have (and still use!) my first stamp, a little Hero Arts Santa. 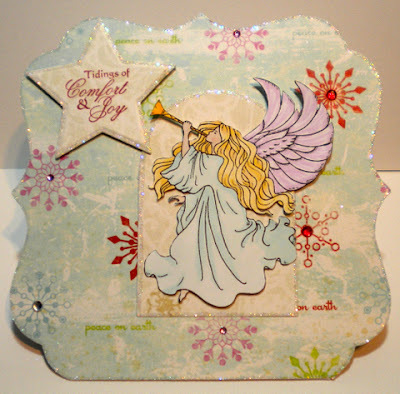 I cringe when I recall my first cardmaking attempts, though I thought they were wonderful at the time. Back then we just stamped a picture on a plain white card and coloured it with pencils or felt pens, with maybe an embossed sentiment if we were adventurous. Things have certainly come a long way since then. Most of my projects are nature-inspired, and there is plenty of that around our new abode. Butterflies and trees are particular favourites. It's a well-known fact that I don't do cute, though strangely the odd little fluffy animal or sweet young lady (a la Sarah Kay) seem to appear on my blog now and then. But you will never see any hippo girls there! Whenever I see one, I get an urge to – I was going to say “deface” them, but actually “reface” them would be more like it! Blogging has opened up a whole new world for me. I have made many new friends through it, and I am proud to be a part of the Stampalot DT, where I never fail to be inspired by the wonderful work of my talented teamies"
"I live in Nottingham, with my husband Steve of 23 years and my fifteen year old daughter, Megan. I am a full time primary school teacher, so I don’t get to craft quite as much as I’d like! I have crafted in some form or another since childhood. I baked, sewed and made Fimo jewellery in my teenage years, but despite having a Mum, Nan and Aunt who were amazing knitters, I never really mastered it. I think it is because I am left handed and they were all right handed! I first discovered rubber stamping when I visited Edwinstowe Craft Centre fifteen years ago. 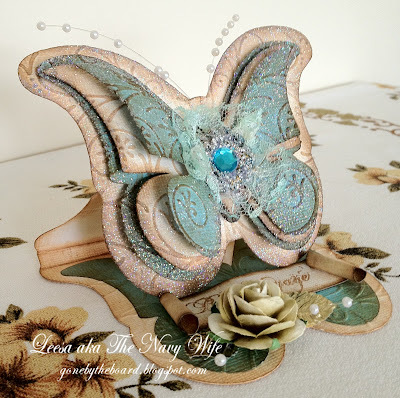 A lovely lady called Sally Ann showed me heat embossing and I was hooked! 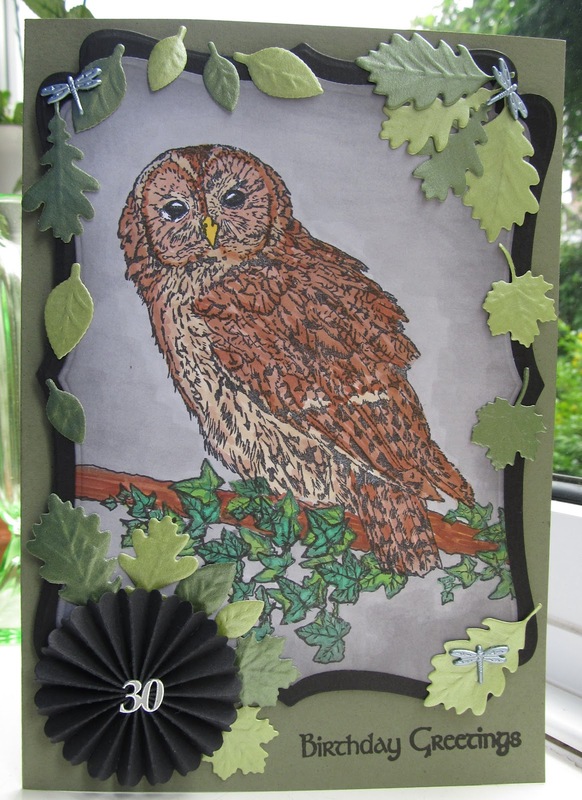 About twelve years ago I was working in a school when the head teacher introduced me to Lynne and said she made cards too. It wasn’t long before we were chatting about different techniques and arranging joint crafting sessions and trips to any craft shop within driving distance! I have been blogging for 3½ years and have made so many wonderful friends here in blog land. I post mainly about my cards, but I still love baking and you will sometimes find photos of my cakes on my blog too, along with photos of scenery and wildlife. I love to create countryside scenes with my stamps and have a large range of trees, butterflies, grasses and flowers. I also have a large collection of distress inks and Adirondack inks, and use a brayer and ink dusters to create backgrounds. 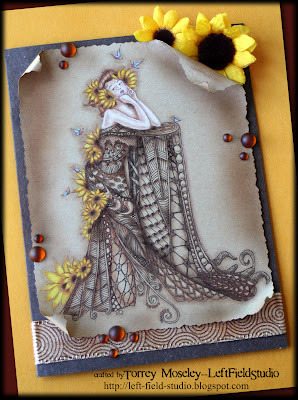 I will very occasionally do cute cards, but like Lynne, I like my girls to have all their facial features! " 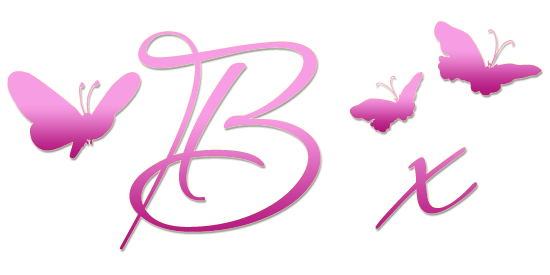 Thank you both for sharing a little bit about yourselves with our blogland friends. There is still plenty of time to join in our August challenge if you have not already done so. Fairies, butterflies, birds and bees, so may possibilities and as always you can create whatever you like, all we ask is that you follow the rules listed at the top and on the sidebar.............the one lots of people forget is that you can combine a max of five other challenges with your entry............... follow the theme and most importantly have fun. New goodies to look out for this month are the new Christmas and Halloween Penny Black stamps, their yummy new Madison DP pack, a fabulous selection of Stencils and Sparkle Medium from Imagination Crafts and new DP's from October Afternoon. Click on the links below to take a closer look. You can tell that the design Team really had fun with this one, just look at the fabulous array of inspiration they have come up with to set yo on your way. Good luck to you all and look forward to popping round and looking at all your entries. Hello Peeps, afraid I am running a bit late with our July winners, I seem to have this problem of time disappearing, I know lots of you have the same and will hopefully understand just what I mean. Huge congratulations to you, please e-mail me brenda@ibas.co.uk with your full postal addy so I can arrange to get your goodies posted off to you. And don't forget the perfect our winners side button. Well done to you all, thank you for your lovely entries, you can all go on collect our top three low go to wear on your blogs. I will be back again on Sunday with our new challenge, hope to see you all then.